Our day trip to Toledo from Madrid was the highlight of our trip to Spain. With its majestic castle perched on a rocky bluff and the Tagus River meandering around it, Toledo is a gorgeous site to see! The city’s mysterious winding streets, cobblestone squares and Gothic cathedrals made me feel like I was part of a fairy tale. Toledo seemed like a living museum, packed with history, art, and great medieval architecture. I’ve only got to spend one day in Toledo, but this ancient walled city dazzled me more than any other place in Spain. Toledo had a tumultuous and fascinating history. 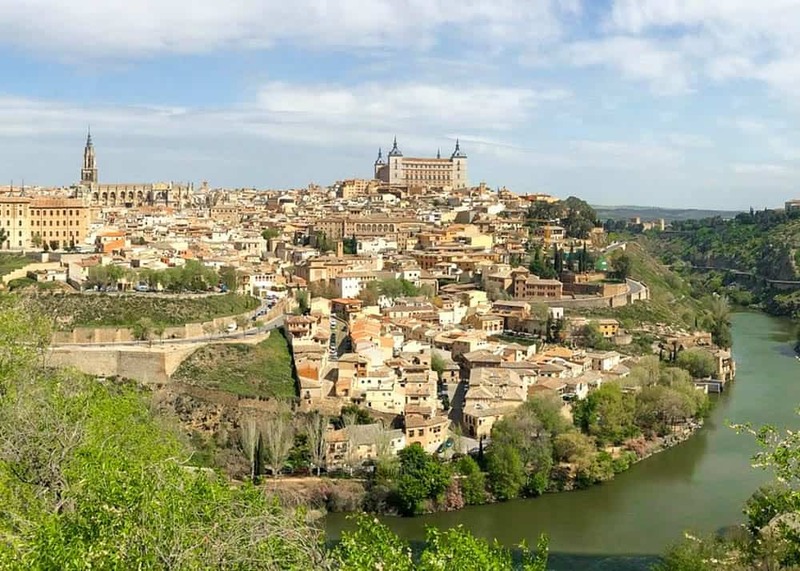 It survived the Moors, the Visigoths, and the Spanish Civil War; it was Spain’s religious and political center and the main site of the court of Charles V; Toledo was a melting pot of medieval cultures. For centuries Christians, Arabs and Jews co-existed peacefully within its walls, making it known as the “City of Three Cultures.” One of Toledo’s biggest draws is the combination of architectural styles that derived from the mingling of these three cultures: Islamic, Jewish and Christian. Toledo makes a great day trip from Madrid. That is of course if you have more than just one day in Madrid. There are several ways to get to Toledo from Madrid. The cheapest and most convenient way is by bus. There is now a bus service that will pick you up from your hotel and take you straight to Toledo. 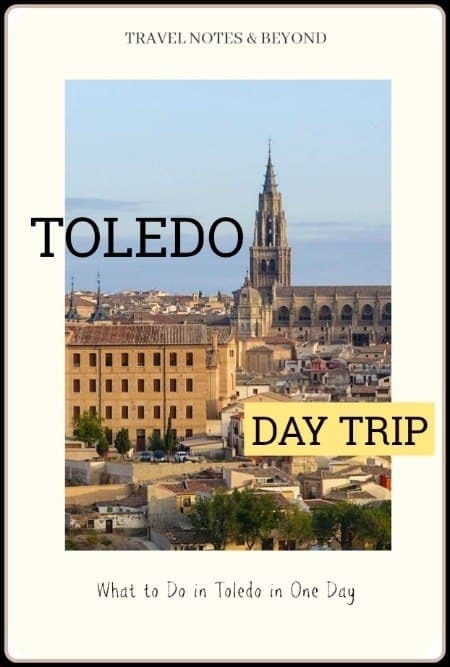 Another possibility is to choose an organized day trip to Toledo. 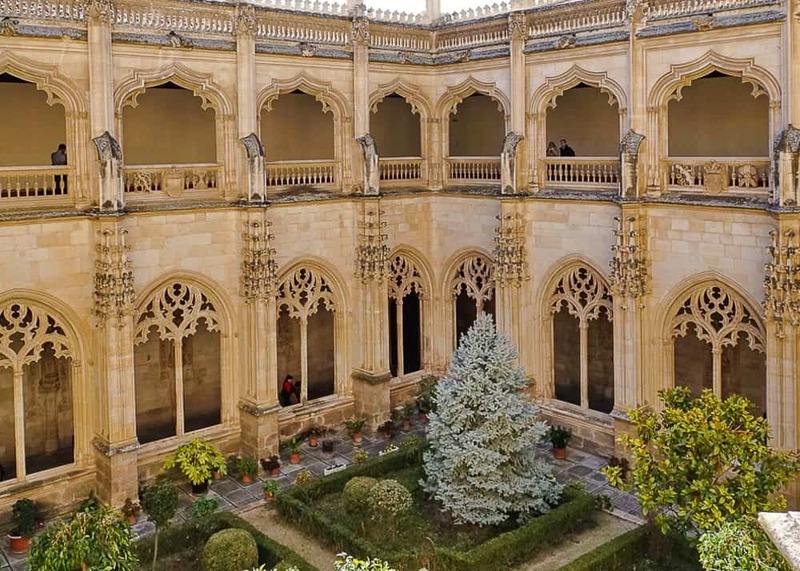 There are several companies that offer all-inclusive guided tours from Madrid to Toledo. The fastest way to get from Madrid to Toledo is by high-speed train . I think this is the best alternative if you plan to visit the city independently. Trains depart daily from the Atocha station. The ride costs €13 each way and takes about 30 minutes. You do not need to make any reservations, just show up and but your ticket at the station. The time tables change quite frequently, so make sure to check the them before departing for the station. Trying to fit all the attractions of Toledo in one day is nearly impossible. There are over 30 museums and art galleries, more than a dozen churches and temples, and countless monuments. But with some careful planning you’ll be able to visit the most important landmarks that define Toledo. If you arrive in Toledo by train, you will have a short walk up to the city walls. 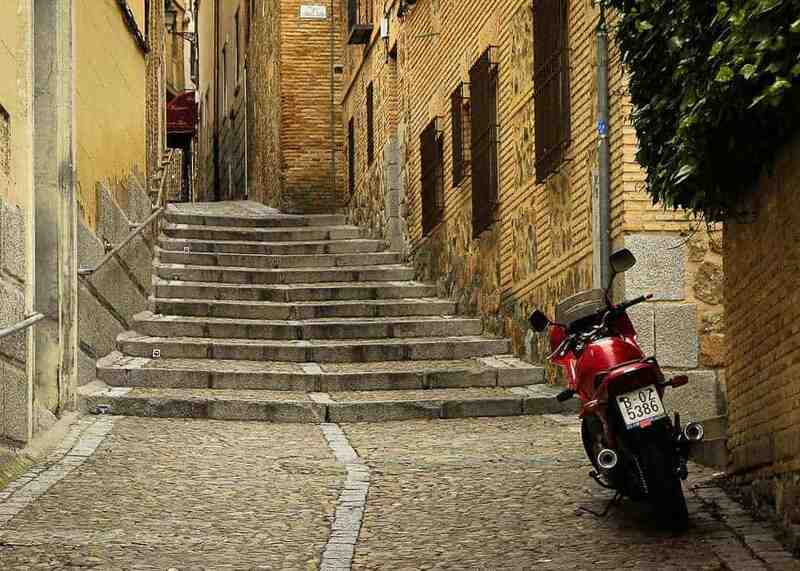 The streets in Toledo are quite steep, so if you want to minimize the uphill walking you have two options. One is to take a cab to the historic center (around €7) and get off at Alcazar, which is the highest point. The other option is to buy a ticket for the Toledo Hop-On Hop-Off Bus (€14 for one day). Before entering the old town the tour bus goes first on the other side of the river and stops at some great viewpoints. Whether you go there by bus, by cab, or by foot, make sure you don’t miss these lookout points. The panoramic views of the city from across the river are stunning! The medieval old town is a labyrinth of winding pedestrian streets and alleyways. Finding your way gets sometimes pretty confusing, therefore it’s a good idea to buy a map before you start your walk. 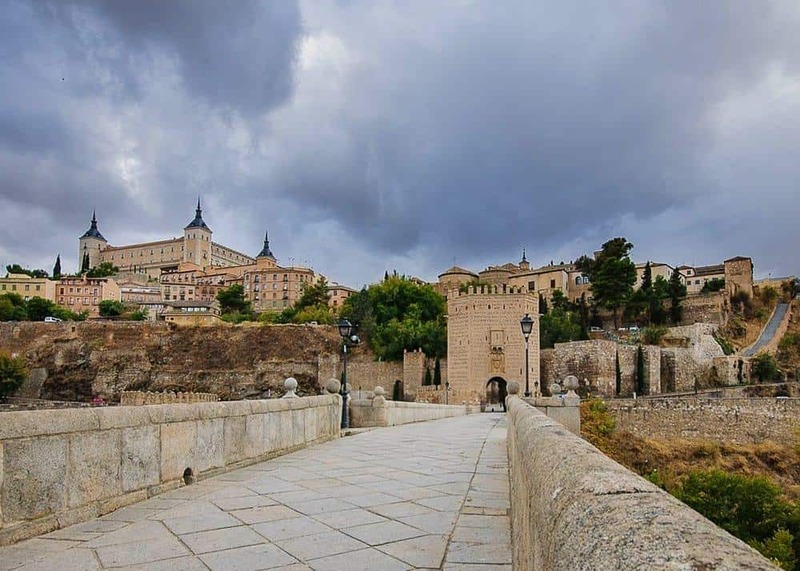 Certainly, you can book a guided tour of Toledo if you choose to, but we preferred to explore the city on our own. 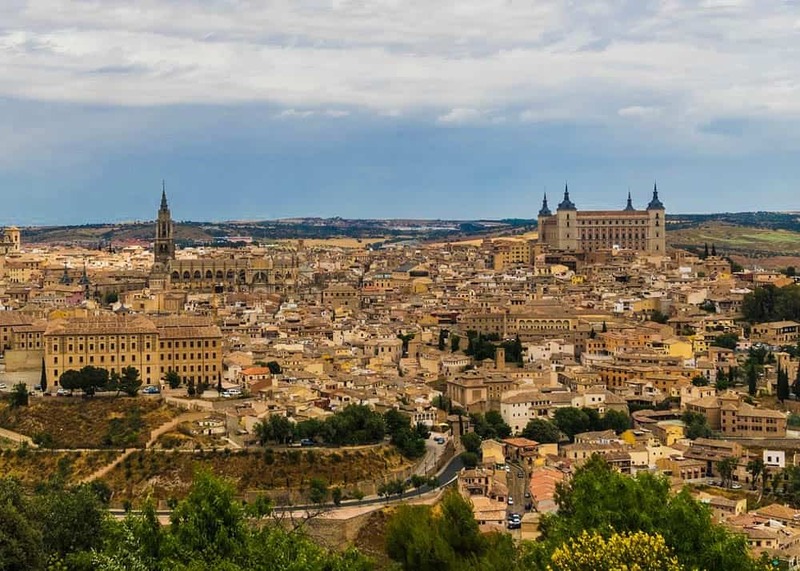 Toledo is divided into 3 major neighbourhoods – the Jewish Quarter, the Christian/Roman Quarter and the Muslim Quarter – all of which are interesting to visit. A good place to start your day in Toledo is in the main square, where the tour bus will drop you. This is the highest part of town where you’ll also find the palace-fortress of El Alcázar. The original building was a fortress built by the Arabs in the early 8th century. Later on the Spanish kings expended the fortress and eventually converted it into a royal residence. El Alcázar is today the site of the Army Museum. The museum has a huge collection of army-related artifacts, from knights on horseback to modern aviation, toy soldiers and all things military. We decided to get in, but soon realized that was a mistake. The museum is outstanding, but way too big to be experienced properly if you only have one day in Toledo. If you want to spend time visiting the Army Museum is fine. However, if you are expecting to see a beautiful castle interior you’ll be disappointed. Alcázar doesn’t look anything like a palace inside and there are hardly any views from its windows. So if you are only interested in visiting the building, the best experience is the exterior view. The Cathedral of Toledo (La Cathedral Primada in Spanish) dominates the city both architecturally and artistically. It is the second largest cathedral in Spain, after the one in Seville. Erected on the site of a former mosque, the Cathedral took 267 years to build. That seems like a great deal of time for a construction! But when you look at this marvelous building you’ll understand why its completion took so long. The Cathedral is absolutely stunning, with elaborately carved portals, a soaring 300 feet tower, and five naves stretching over 120 meters in length. The interior is also jaw-dropping. There are so many artistic and religious artifacts! I was blown away by the sparkling gold reliefs, wood sculptures, decorated columns, and stained-glass windows. Don’t miss the religious paintings of the great Spanish artist El Greco when visiting the cathedral! This church was originally planned by Ferdinand and Isabella as their last resting place. They changed their plans later and chose to be buried in Granada. The most remarkable part of the church is its double cloister, which is decorated with carved stone arches and pillars. Hidden behind Plaza de Zocodover is Toledo’s most interesting museum and art gallery: Museo de Santa Cruz . The original building was a hospital during the 16th century and was built in the shape of a Greek cross. Besides containing a great art collection and many paintings by El Greco, the building’s beautiful architecture is a draw in itself. This place is worth visiting even if you are not a big fan of museums. It is also a good choice if you want to skip visiting El Greco Museum, yet see some of the artist’s famous paintings. Puerta Vieja de Bisagra is only remaining part of the Moorish town walls. 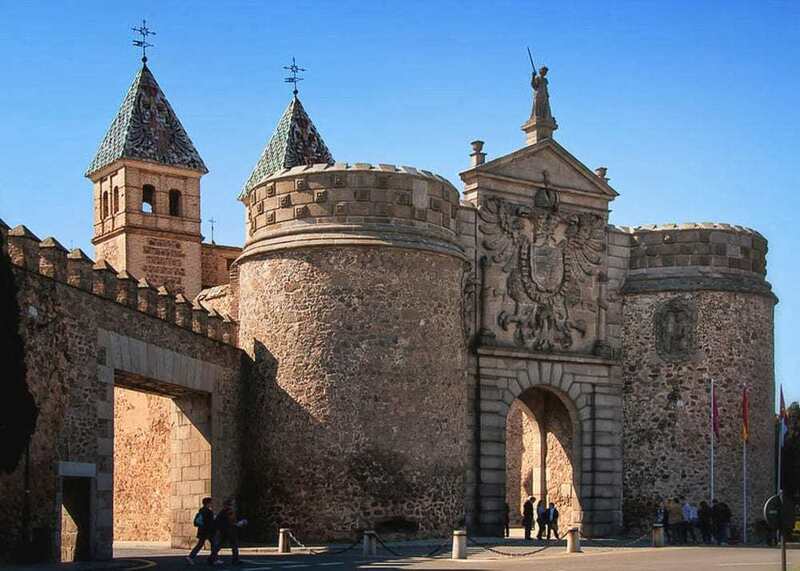 It’s easy to imagine the strength of Toledo’s ancient walls was when you stand before the monumental Gate of Bisagra! To get a good look at it from the distance, you’ll have to basically leave the historic old town and cross the highway. Then you’ll have to return and pass through it again. Puerta de Bisagra is the kind of landmark that you’ll only enjoy for a brief couple of minutes, while you pass through it. Nevertheless it’s worth seeing. Toledo is known for its traditional crafts, including antique-inspired swords. It’s hard to resist the temptation to acquire one of these marvelously crafted swords that are on display We bought three! If you are into swords, knives and amours, walk into some of these shops to admire the big variety. Some stores also explain and demonstrate how the swords are forged, using the damascene technique. It’s quite an experience. 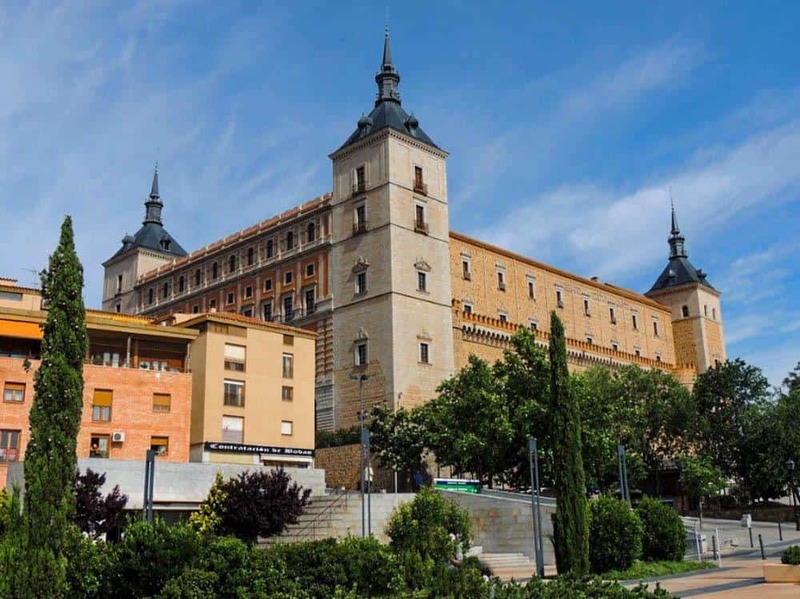 There are many other interesting sites to see in Toledo, like the El Greco Museum, the Synagogue of Santa María la Blanca, or the Mosque of Cristo de la Luz. Unfortunately, you can only do so much on day trip to Toledo from Madrid. In the end, how you decide to spend your available time in the city depends a lot on your travel style and interests. Try to arrive very as early as you can (before 9am if possible), and leave late. Toledo is a very popular destination, so many tourists will follow the same itinerary as you. Before you plan your day trip to Toledo, bear in mind that some attractions are closed on Mondays. Wear comfortable shoes. The streets in Toledo are quite steep and walking can be physically demanding. If you choose to book an escorted day trip to Toledo from Madrid, be advised that you will not be allowed to stop in and shop as you please. You can only visit the stores that the tour company has an “agreement” with. And those are usually the most expensive ones. It is possible to enjoy the city without spending a lot of money. You don’t need to visit every museum, or get into every church. Simply walking the streets and admiring the landmarks can be a lot of fun. If you have never visited Toledo, make sure to include it into your next European itinerary. There is so much history in this city, so many great sites to see, and good food to taste! Did you enjoy this post? Pin it for later. What a beautiful city to explore. I can see why it was the highlight of your time in Spain. Great tips about getting in early and leaving late, to maximise time in town and not in traffic. I visited Toledo for a day drip when I was in Madrid. It was a beautiful place with rich history and stunningly architecture is definitely worth the visit. Toledo is a perfect example of a town where you can soak in the essence in a capsule...and also spend a couple of days knowing more. And so conveniently located, close to Madrid. I loved the Jewish Synagogue and El Greco's masterpieces. Pity I missed Toledo when I was in Madrid. I didn't know that it's so close and only takes 30 minutes by train! I'm a bit like you guys too, I prefer to walk around on my own as opposed to going on tours. I love getting lost in old cities. Toledo sounds a bit like Granada, which also has Jewish, Christian/Roman and Muslim Quarters. 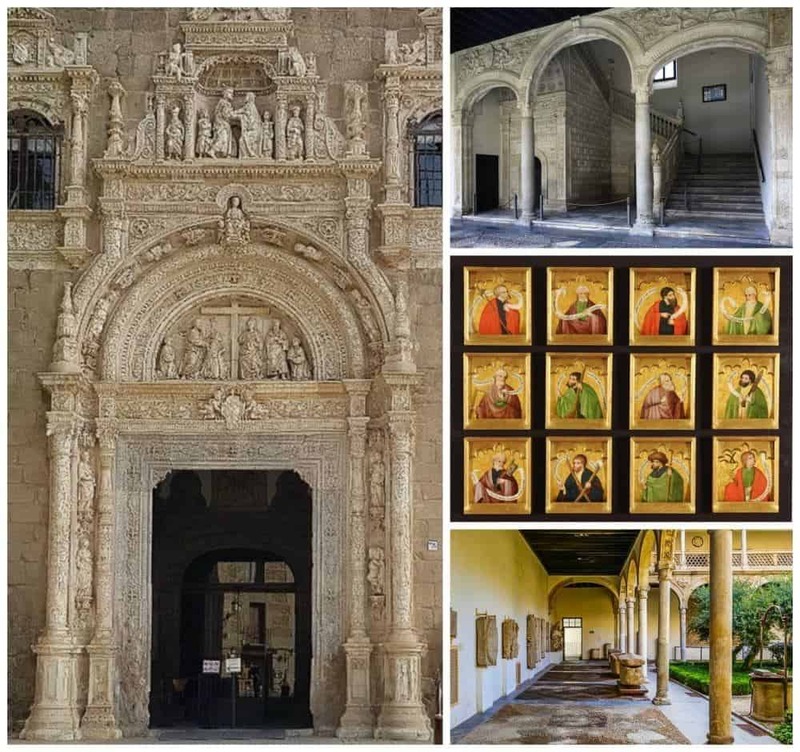 I adore the ornate architecture of San Juan de los Reyes, and Museo de Santa Cru sounds like a must-see especially for El Greco's paintings. Toledo is known for its swords? - well that sounds like a medieval gem to visit. It looks absolutely magnificent and this couldn't come at a better time, considering I am planning a trip to Spain soon. The architecture is magnificent its no wonder it took 267 years to build! Is it worth spending a week there to relax and enjoy the sites? Great tips. I am still guted that I missed Toledo and drove straight pass it, now I wish I didnt now I seen your photos and read this post. Hopefully heading back to central Spain in the summer so its defo time to check it out! La Catedral Primada took 267 years to build? How is that even possible? It's as gorgeous as the La Sagrada Familia. That monastery looks like a piece of Vatican for me. Toledo I think is a great place for Roman Catholics and lovers of heritage. I will definitely add this on my list when I have a chance to go to Spain. I'm hoping to return to Toledo myself too, Mei. I miss it already. Good to know that you can do Tolefo in a day. I definitely would love to see Alcazar. It has always fascinated me... Good tips on how to get there from Madrid. Hahaha, I didn't know about that phrase, Rob. Toledo is very beautiful, you should go visit it. It looks like an amazing city, and as usual, your photos are stunning! I haven't been to Spain (yet), but when I eventually make it there, Toledo is going to be on my list. I´ve enjoyed reading your post and seeing pictures so much! I´ve also been to Toledo once, as a day trip from Madrid. It´s such a gorgeous city and I really liked The Cathedral ´s architecture and interiors. I´m planning to go back soon, it´s been almost 6 years since my last visit to this medieval capital! We just spent 3 days in Madrid and toyed with the idea of going to Toledo but ultimately decided not to. I'm now going to spend this whole weekend kicking myself! It looks incredible and you've got so many great suggestions of ways to spend the day. Oh well, guess it just means I have to go back!? If you only had 3 days in Madrid, there wasn't enough time to go to Toledo, so don't be sorry. Madrid is such a great city to visit too. 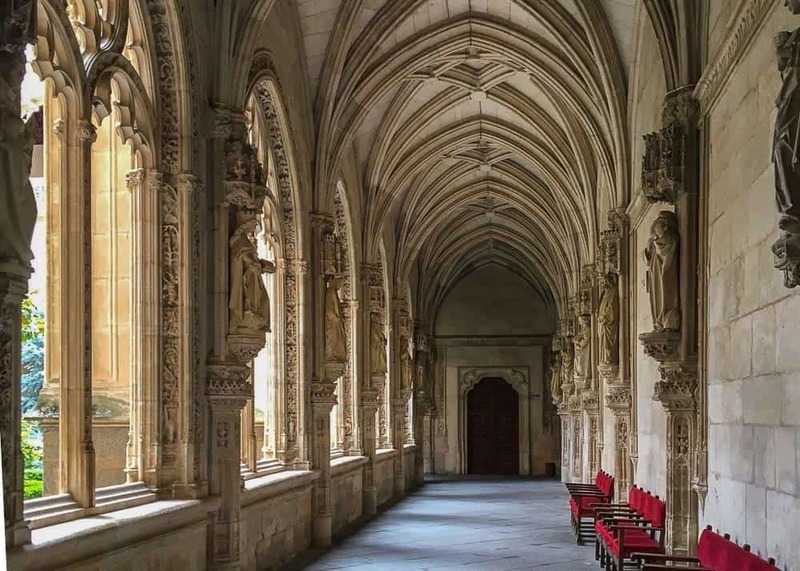 I've not been to Madrid or Toledo and this all looks lovely - the architecture in particular is very beautiful ;-) I'd probably need at least 1 day or more to explore here. I agree, Jessica. We were sorry we couldn't spend more time in Toledo. My Spanish teacher in high school was from Spain and I remember her teaching us about Toledo. Then my husband went there on a business trip and I was so envious. Stunning city and stunning photos! I sure hope I can explore Toledo - and Spain - someday! Toledo has been on my list for a long time, so I'm quite glad to hear your praise for this city! Makes me want to go only that much more!! Spain is not so far from you, Lolo. You should go. What beautiful pictures, so many wonderful things to see! I have fallen in love with it already! It sounds like Toledo might be worth more than a day trip. If you had to do it over again, would you stay overnight or even longer? I definitely would. I was sorry for not planning more time there. Wow, I'd never heard of Toledo before (outside of the US version), and I'm so glad that I clicked on your post, because far out, it seems amazing. All of those medieval buildings! And your panoramic shots are gorgeous... I'm pretty sure I'd be in heaven here. Hope you'll get to visit the historic Toledo someday. What you'll discover has no resemblance with its US counterpart. Toledo is an amazing city. There is so much to see and I couldn't fit it all in with an overnight stay. I enjoyed the Old Jewish Quarter and particularly liked all the El Greco museum as well as seeing his most famous painting in the Church of Santo Tome. I like the idea of taking the high-speed train from Madrid. Your highlights to see on a day trip to Toledo are spot on. Thanks, Rhonda. You were lucky if you could spend a night in Toledo. We only had time for a day trip to Toledo. I have not made it to Toledo yet, but it looks like a great day trip. The architecture there is stunning, especially the Cathedral. It does look like a great city to walk around and explore. It is a great place to visit, Anisa. You should go. Oooh, I love this post! I studied in Salamanca and simply love this region of Spain. Toledo is such a rich city!